Been so busy that I’ve neglected my blog for a bit. I’m even contemplating opening my own e-commerce site along with my Etsy. It’s trying to find the time to fit it all in. Anyway….here’s some new work. I’ve actually had many months of new work..lol…..but I’ll show this. Fill your heart with art. My name is Manon. (pronounced Man + O) Yes….my mom cursed me with my name. In her defense I guess she never though I’d leave Quebec. I’m a jewelry artist and painter. I’ve been creative as long as I can remember and things haven’t changed. I now live in Scottsdale, AZ with my man, Rob. I spend most days in my studio making pieces that speak to my heart. Thanks for stopping by!! We recently moved and have been renovating a new home so I was out of commission for over a month. I will post new studio pics soon. 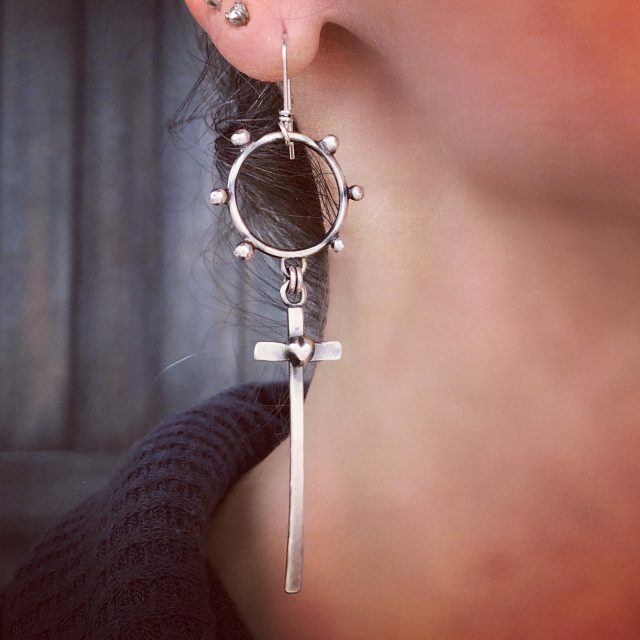 This past month I started working again and here is a pic of a few sterling and fine silver earrings I made. These were nature inspired. It’s been a crazy last few months. 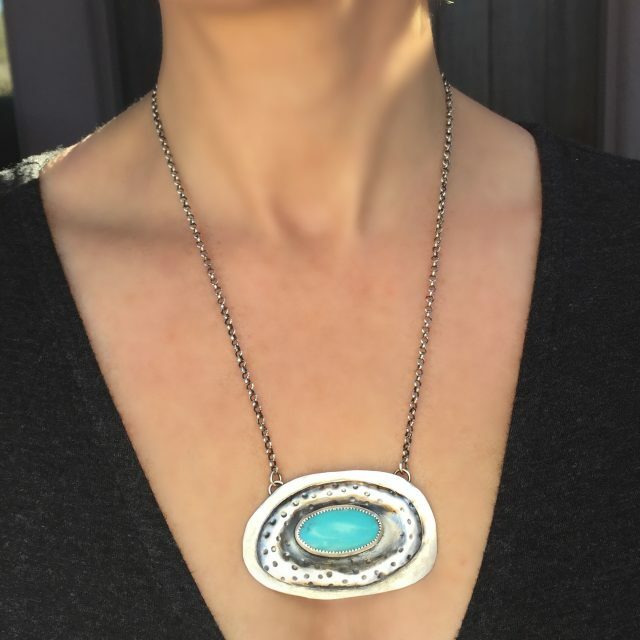 I’m happy to be newly represented by the Caravana Jewelry Gallery in the Tlaquepaque area of Sedona, Arizona. I recently dropped off over 25 pieces to them. It’s a beautiful gallery that I’m thrilled to be a part of. 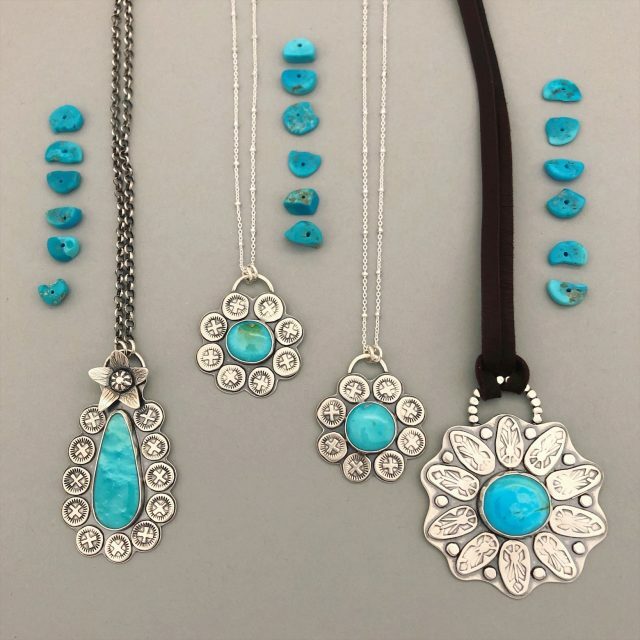 I made many turquoise pieces for the gallery in Sedona but I also sent some cool sterling earrings that I’ve had a lot of fun making. My Etsy shop has many other hoop earring versions also. 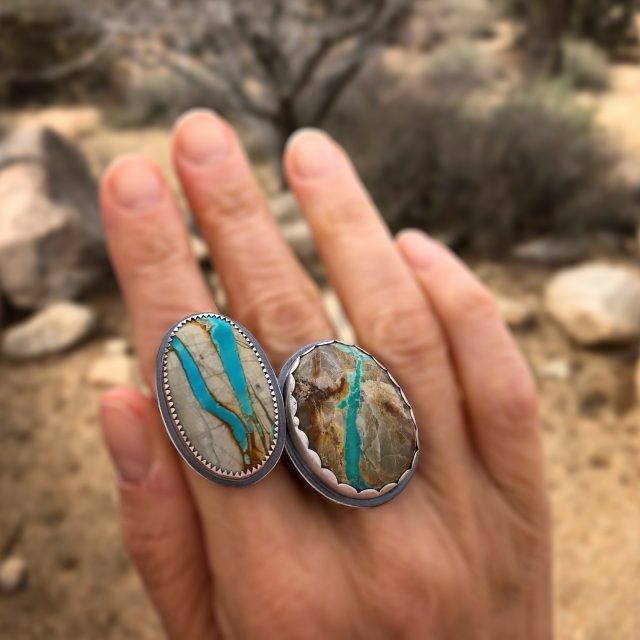 Turquoise rings are also popular here in Arizona so I have sent quite a few to Caravana. 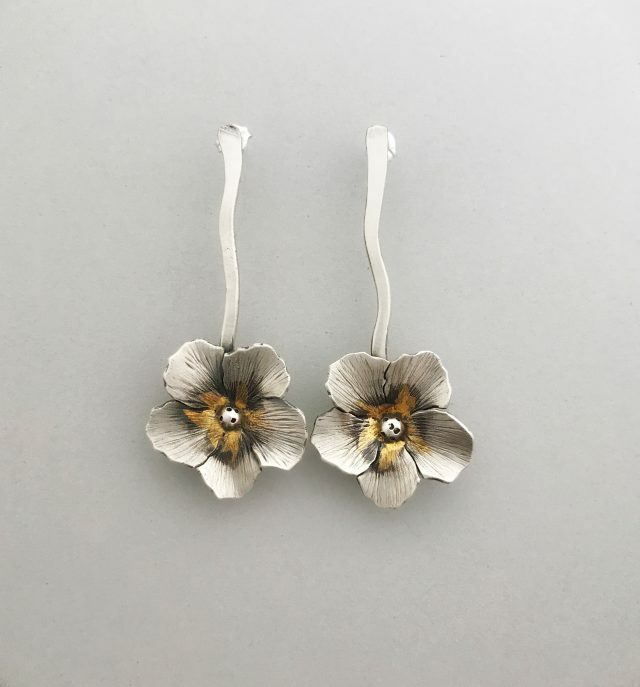 In other jewerly making news….Since I’ve been growing my hair I’ve found a lack of hair accessories for women that I like so I’ve been making some myself. 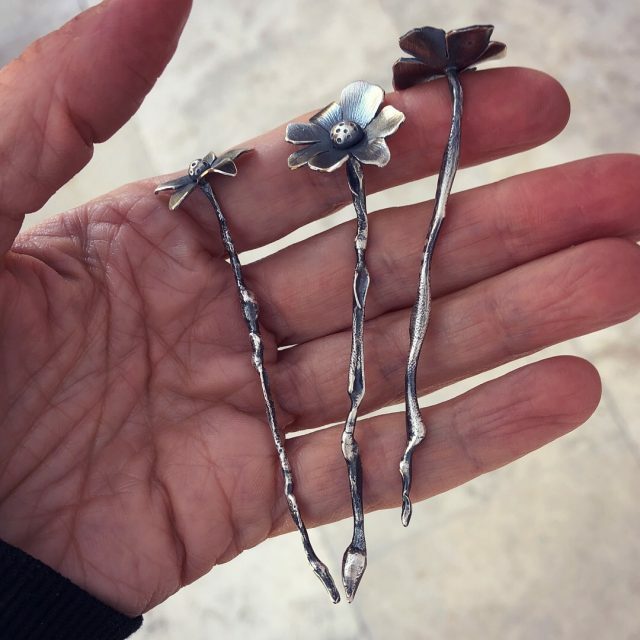 These hair pins are so cute and look great in a bun or ponytail. I make everything one at a time so each stem and flower are unique. 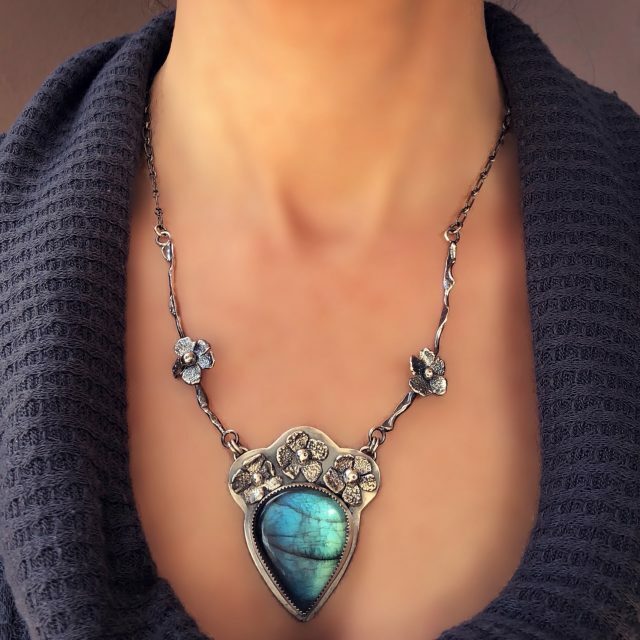 Last week I finished this beautiful Labradorite pendant with flowers. 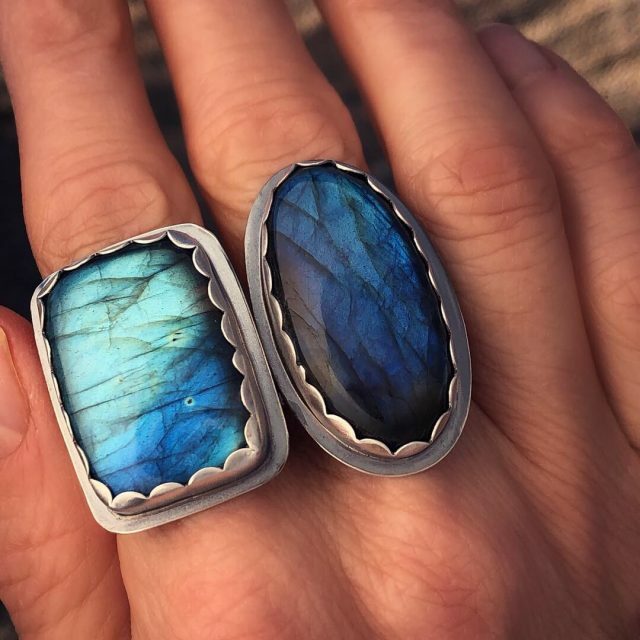 It’s quite a pretty stone that has an amazing blue flash. Btw….I have a show coming up in Cave Creek, AZ. April 7th and 8th. Email me for all inquires. It’s nice to add a pop of gold to some of my work. I’ve quite enjoy the process of making Keum-boo jewelry. Fill your heart with art and Keum-boo jewelry. I’ve been working with deerskin leather cord in quite a few of my recent pieces. I make sterling beads for them. 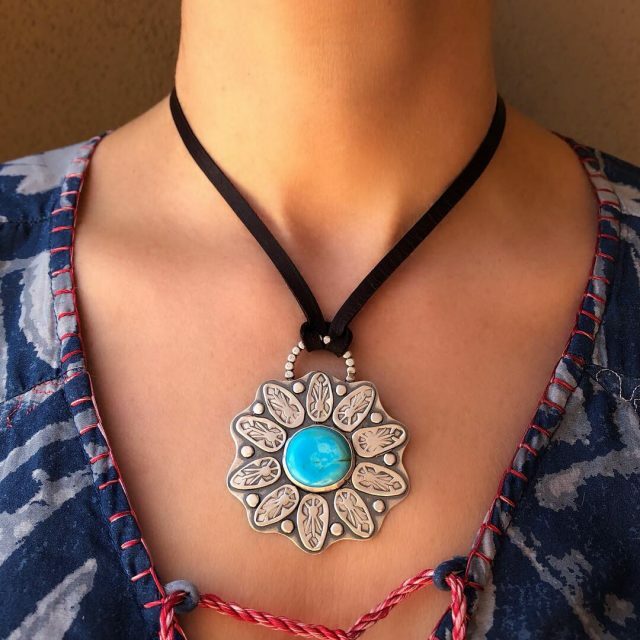 Two attach to the ends and one in the middle that allows you to adjust the cord to go up and down therefore the owner can wear the necklace long or short. I love the way these look. They’re also a breeze to put on and take off. 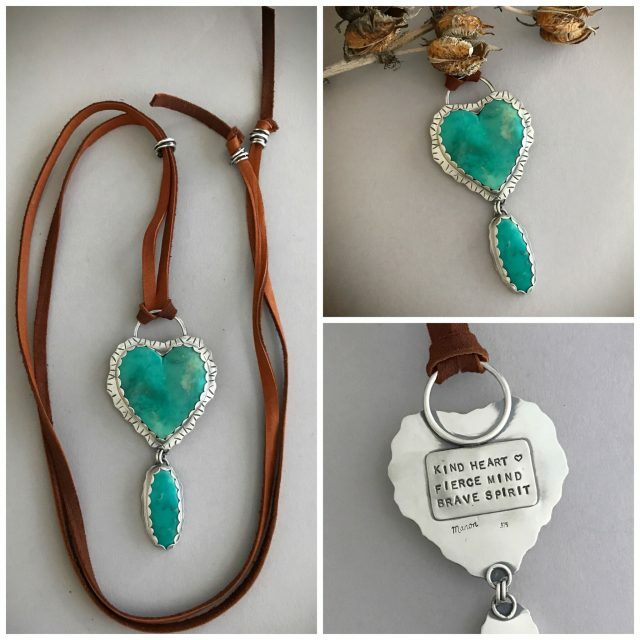 This one features two Arizona Kingman turquoise gemstones. 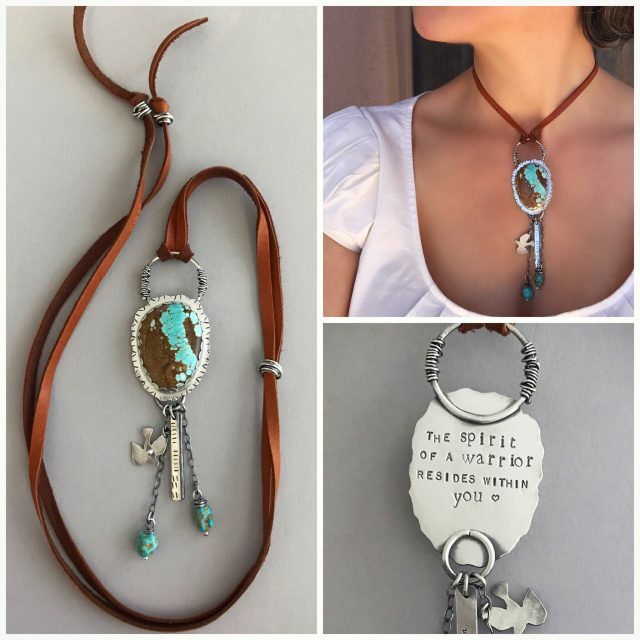 The saddle colored deerskin leather cord lends itself well to this turquoise. The arrowheads are pretty cool. This is a great necklace that you can wear long or almost to the neck like a choker. 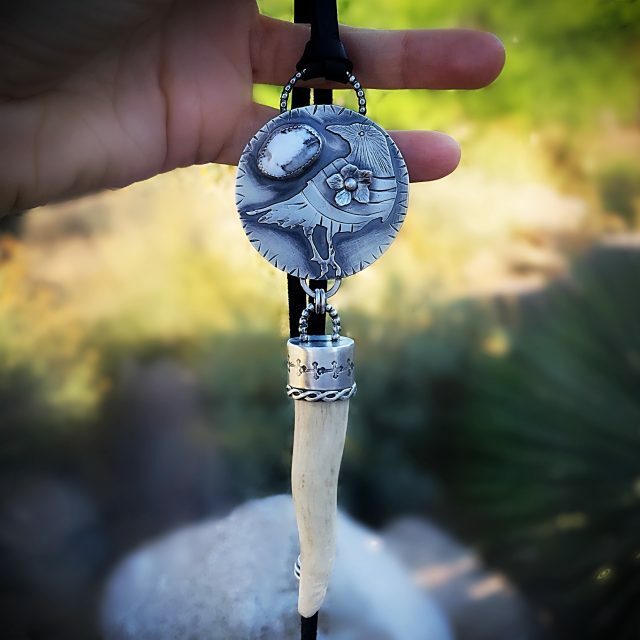 Of course this necklace which features a naturally shed deer antler is perfect with the deerskin leather cord. This one is very striking on. 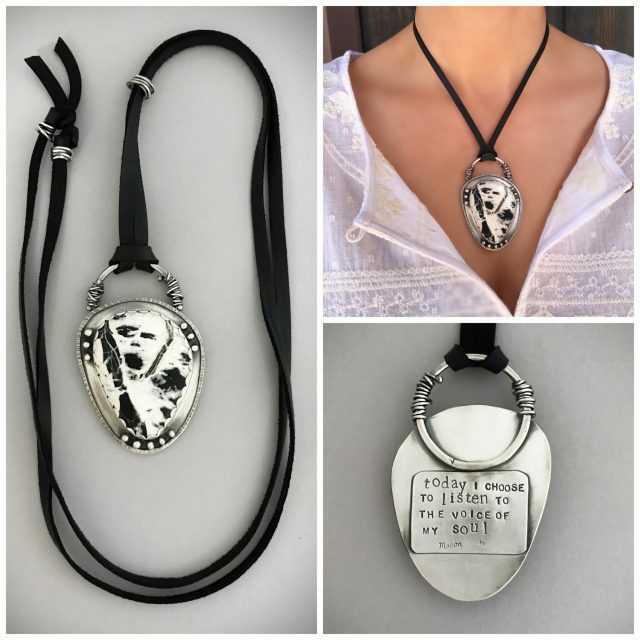 I will have more of these pendants with the deerskin leather in upcoming weeks. They’ve been very popular for me and I love making them. Last June I made a decision to stop coloring my hair. 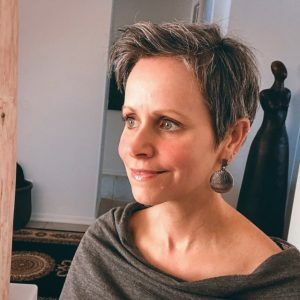 My hair had also been in a pixie cut for the last 15 years or more. I was sick of super short hair and tired of coloring. On top of it….every single time I colored my scalp it would itch for days. 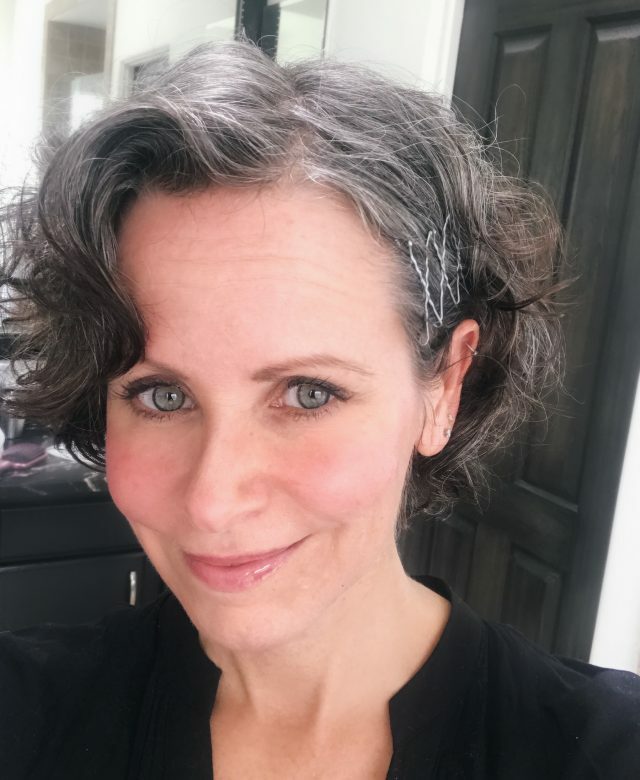 Enter my journey to grey hair…or the more beautiful term …silver hair. My mind was made up when all I saw was younger women dying their hair grey….. a new trend. What????? I had that going on beneath my dark tresses. The hardest part was the first two months. I wasn’t used to seeing roots let alone silver roots. There were days that certainly tried my patience. But….I’ve persevered. 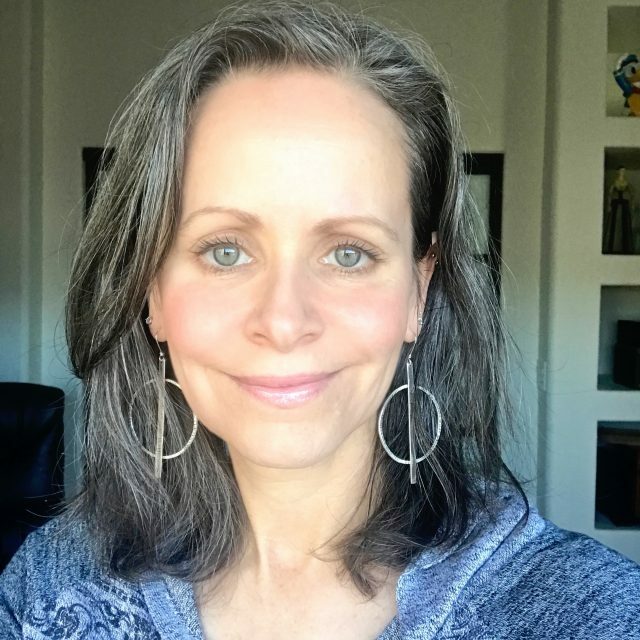 There are so many positives on this journey to grey hair. First of all my hair is so much healthier….yay. It doesn’t look like I have a dark helmet on my head anymore. ( the older I got the more dark hair didn’t compliment my skin anymore.) I’ve had so many positive comments and many of them are from men. (turns out a lot of men like the natural color on women.) 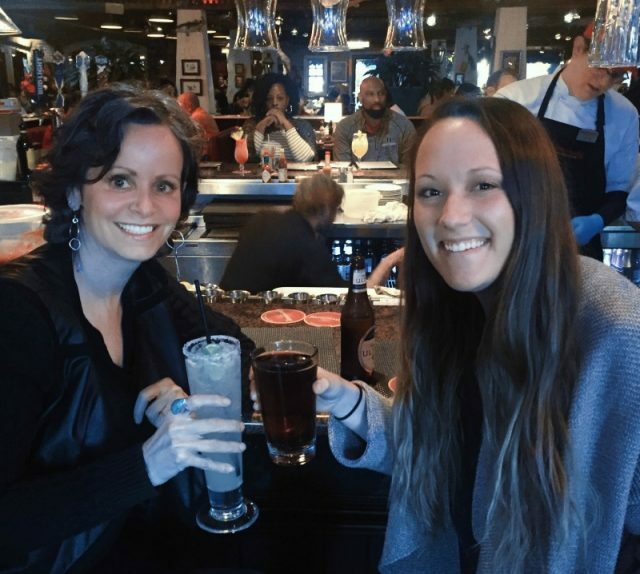 The shocker is how many young women have commented and have asked me who is doing my color…..lol. I’ve had a couple of trims since I began this. I’m doing so many drastic things at once so I needed to keep it looking somewhat fresh and let some of the layers catch up. I still have about an inch of colored hair left in some areas but I’m a few months away from getting rid of the last bit. I’ve learned to wash my hair every two days. My hair is wavy/curly so my go to styling products are Aveda. With these I can extend my non shampoo days a little. For my shampoos I’ve included a pic of my favorites. 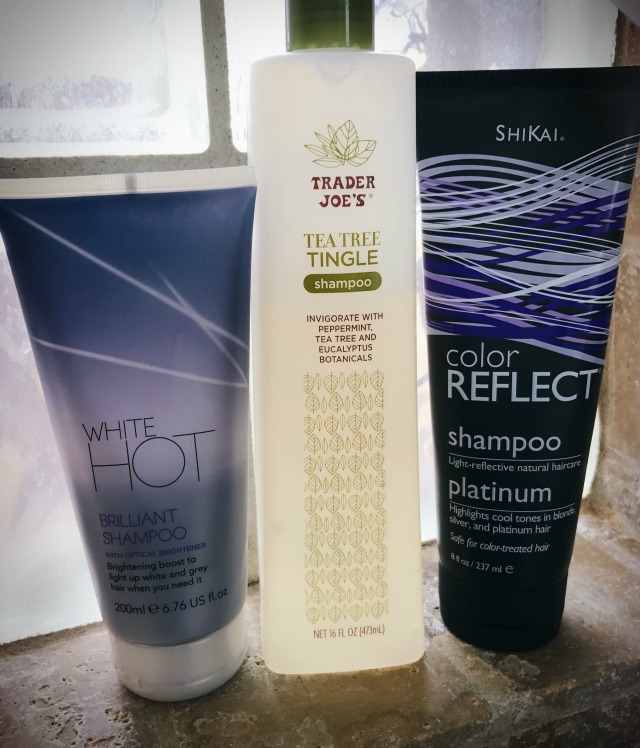 Shikai Color Reflect shampoo is a great natural shampoo for silver and blonde hair. I buy it at Sprouts but I think Whole Foods also carries it. White Hot Hair Brilliant shampoo is from England. It is also a purple shampoo that leaves my silver sparkly. It’s not that expensive but you can only order it from England. Then there’s Trader Joe’s Tea Tree Tingle shampoo. It’s really cheap but….it’s sulfate free and clarifying. My hair shines so much when I use it. I use a conditioner right after because my hair feels a little drier after that one. I alternate between all three of these. 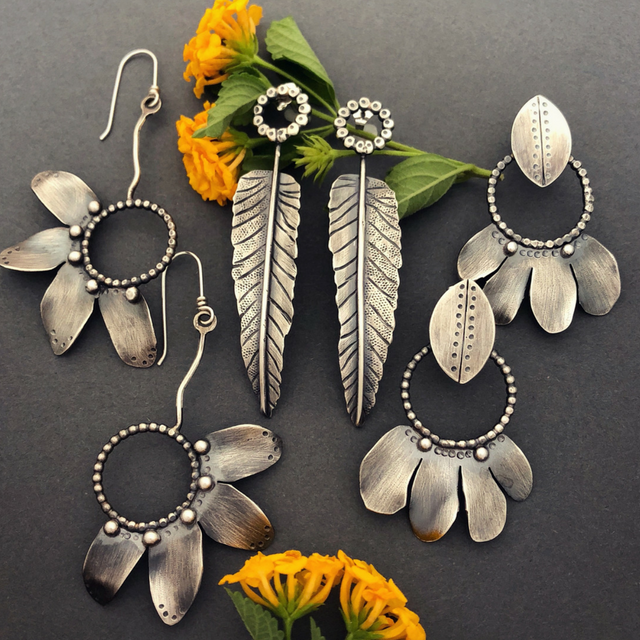 I’ve been obsessed with arrowhead earrings. I’ve made quite a few of them lately. I’m thinking I need to create a large arrowhead pendant with a turquoise in the middle. 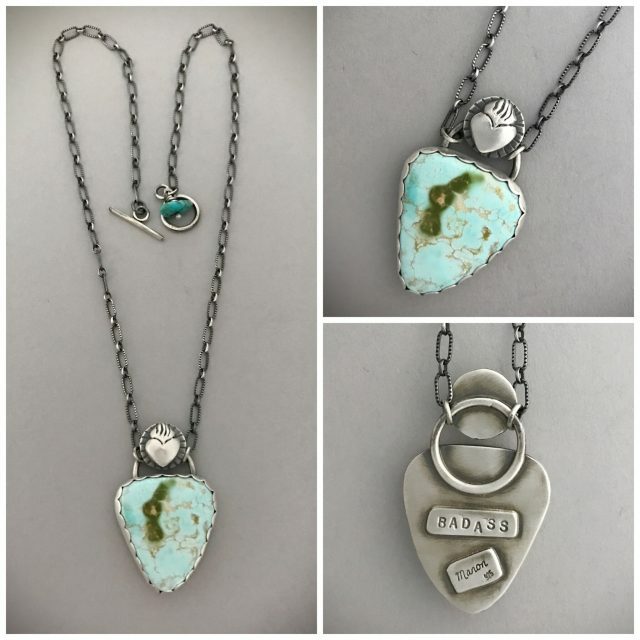 Another *badass* piece with Nevada Boulder turquoise made this past week. My work can be found here at Echo of the Dreamer gallery and at Enter the Earth gallery. Recently Rob and I got to hang out with my old friend who’s also my daughter’s best friend, Kati. Kati was in town to run a half marathon and what was supposed to be a night of dinner with us turned into a few days of fun. 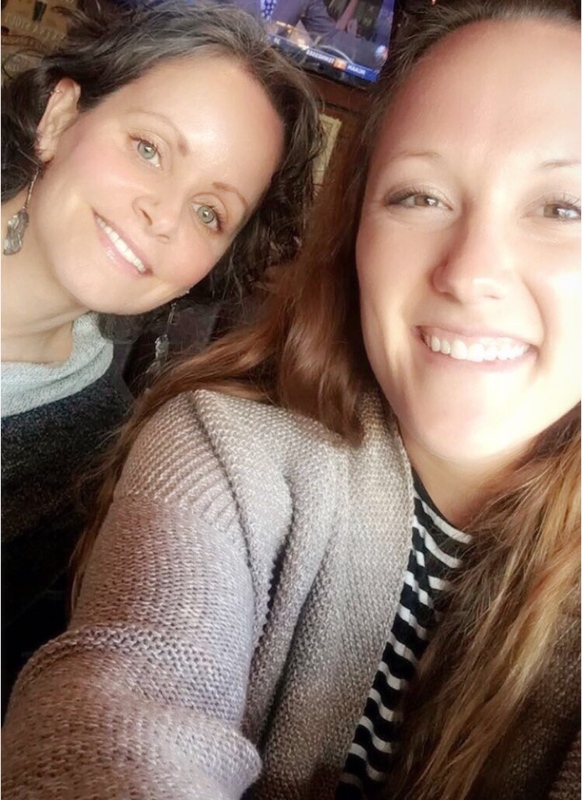 I loved catching up and talking about old times. I think she loves AZ and was sad to go. Hopefully she’ll be back soon. And now to the new friend part of this post. Rob and I rescued/adopted this precious baby two weeks ago. 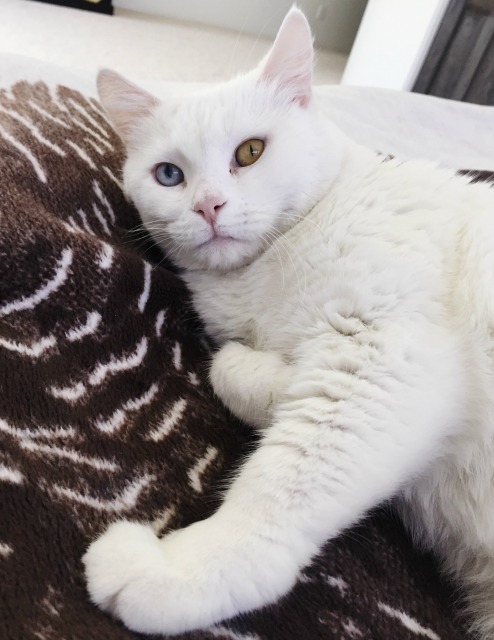 She was found in a park. Her mom had been killed by a coyote. 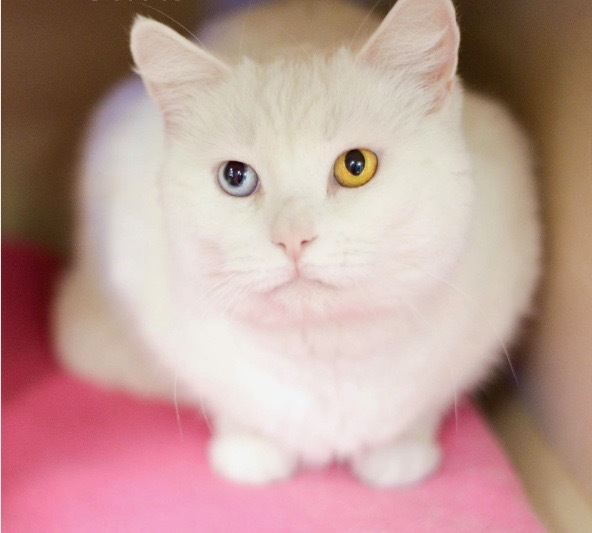 The rescue named her Snowball but we changed it to Zoe. She’s such a sweet girl. We’re thrilled to have found her. Zoe has become comfortable in no time as you can see!!! Between and old friend and new friend…I’ve been busy. 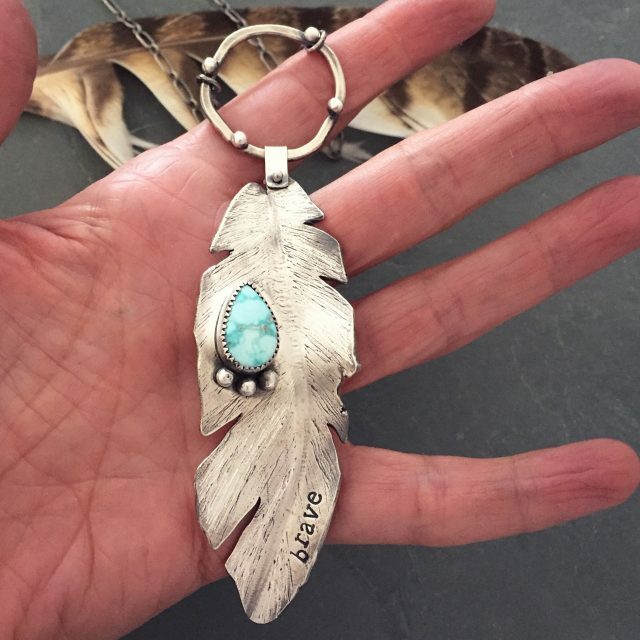 Above is a sterling feather that I created with the impression of a naturally shed horned owl feather. We seem to have a big guy living on our roof lately. His wing span is impressive when he swoops down. 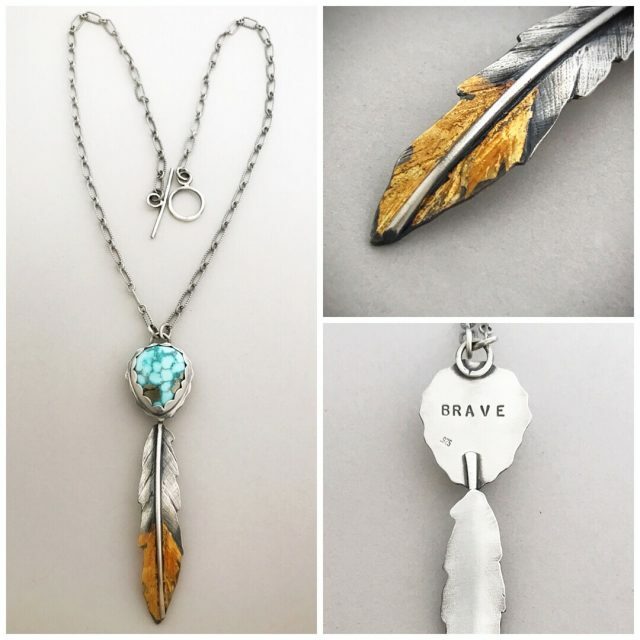 I’ve had quite a few requests to similar silver feathers. They’re pretty large and look striking on. Seven Dwarfs Mine cuff bracelet. 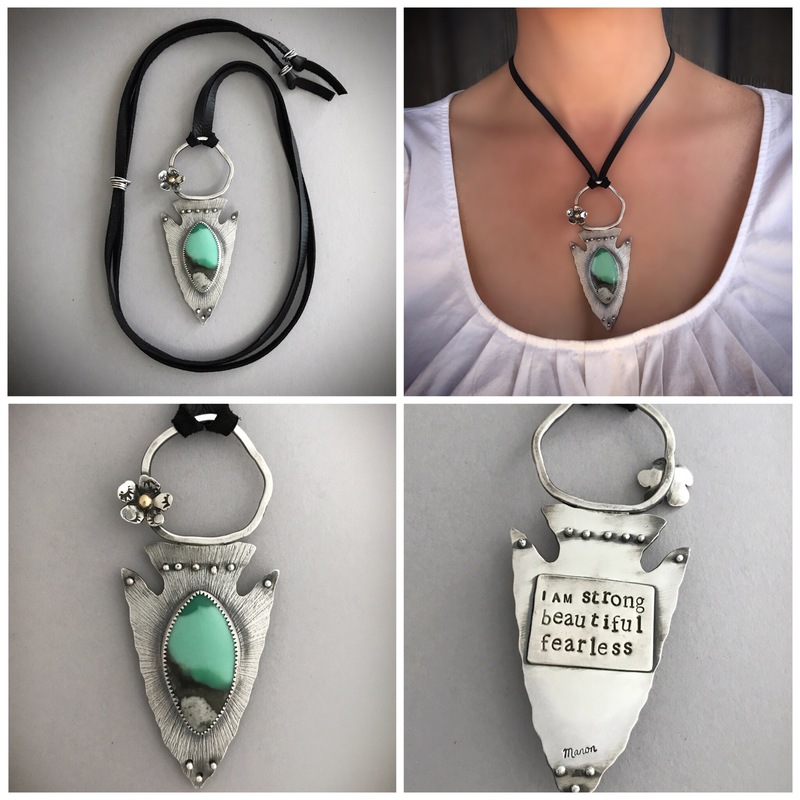 I am a maker of handmade jewelry. All of my pieces are 100% made by me. 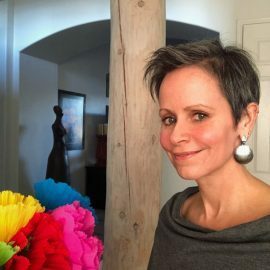 I run my business by myself as many of my jewelry friends and small business owners do. That means I am my own social media, artist, inventory specialist, shipper, fabricator and so on. There are some days that are definitely overwhelming so I’ll take a step back occasionally….lol…..but I love it. 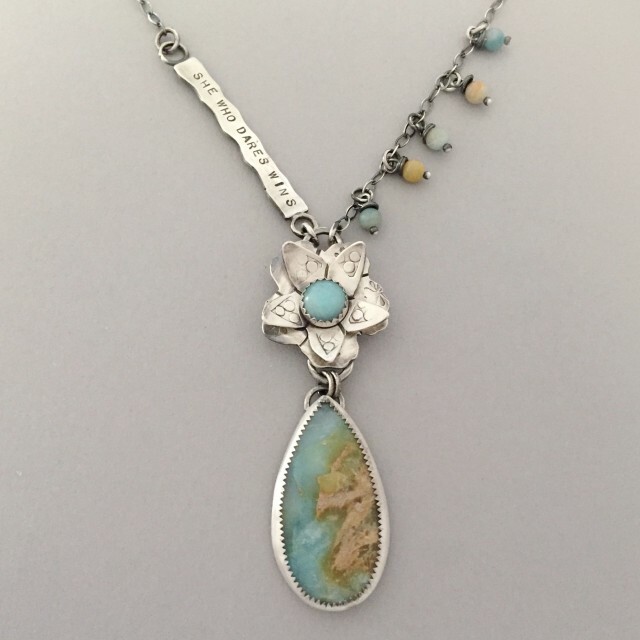 The piece above features a Nevada Seven Dwarfs Mine gemstone. It is a small mine that yields small amounts at the moment. Very pretty stones are coming out of there and they’re quite pricey. 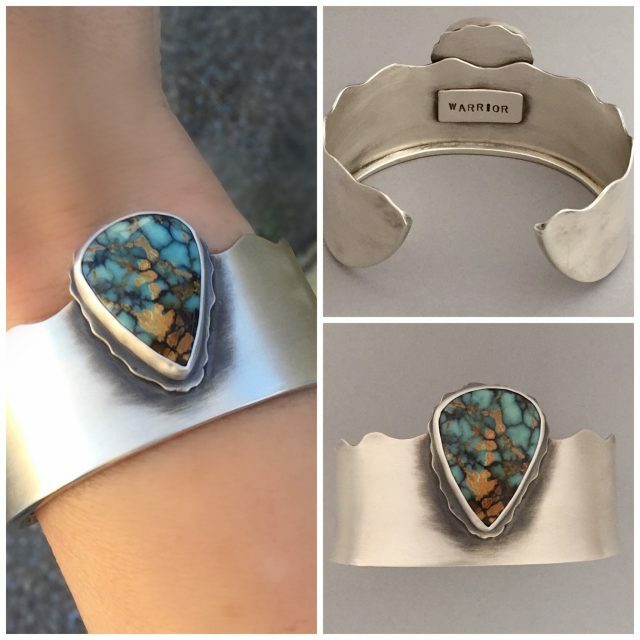 This cuff has a beautiful Arizona Kingman turquoise. 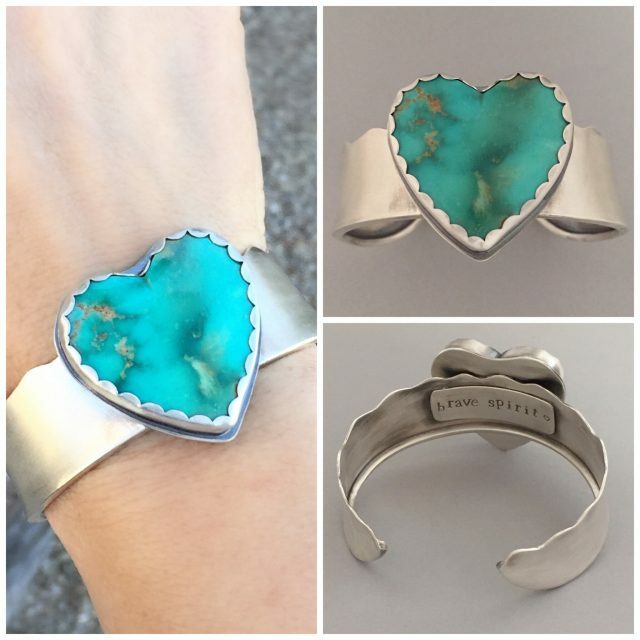 Because it’s cut in a heart shape the turquoise is more expensive due to the fact that the lapidary artist has to waste more turquoise to get this shape. 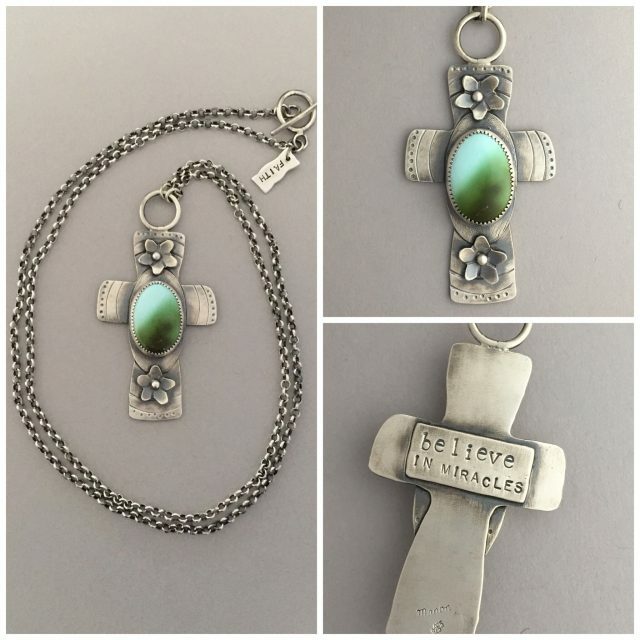 Sterling cross with Nevada Royston turquoise. I’ve always had an affinity for crosses. I’m interested in making more types of these. 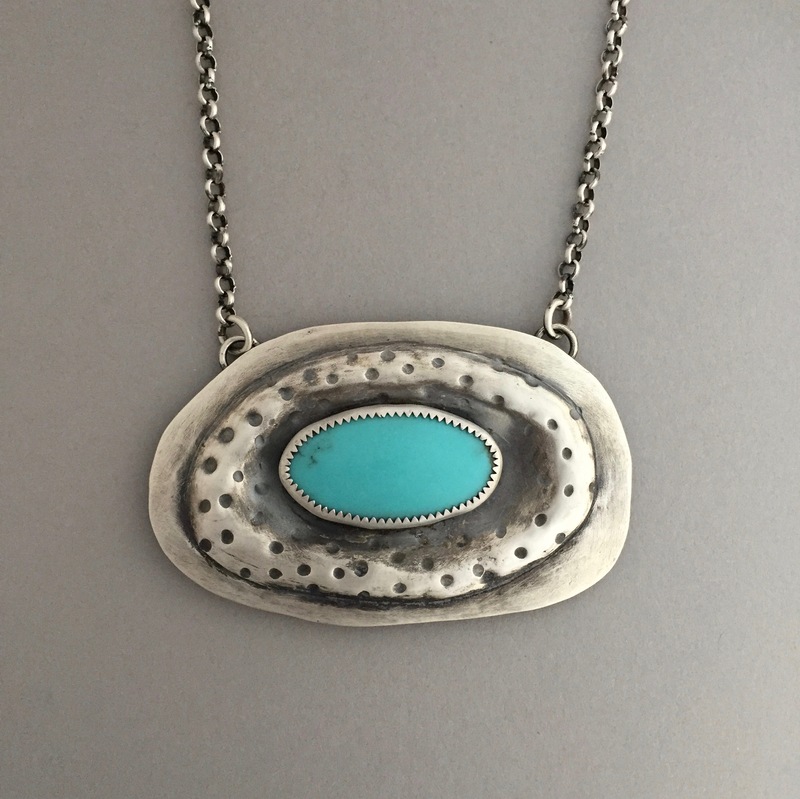 This one features a Nevada Royston turquoise. 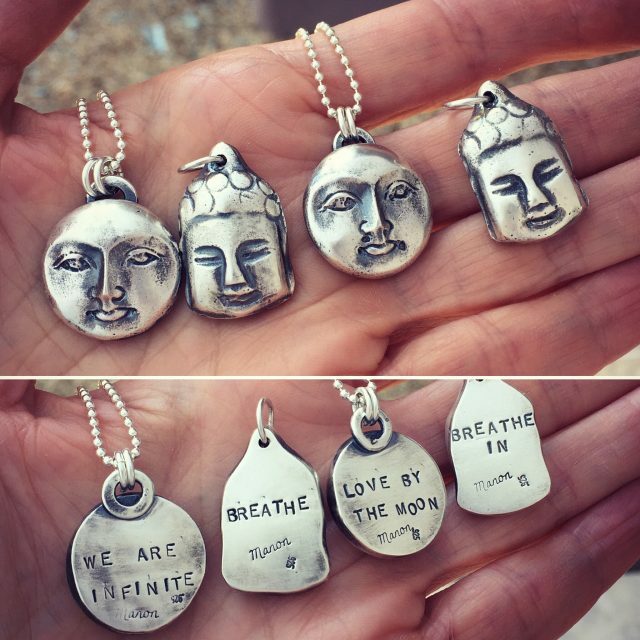 I’ve recently made some solid sterling silver moons and Buddhas with an inspirational message on the back. The moons are in the Balinese carver tradition. 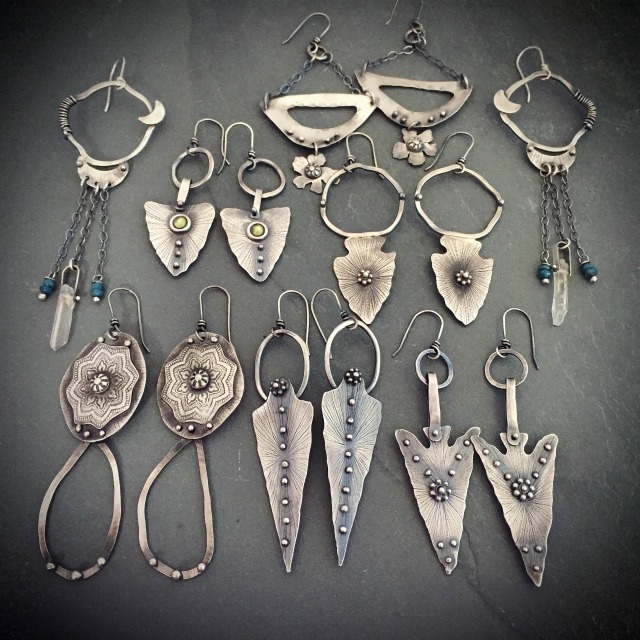 The Balinese are terrific carvers of bone pieces so I’m thrilled that I can honor them in sterling silver. Handmade jewelry is my passion. Every morning I’m excited to get up and see what the new day will bring. Excited for this new year and new techniques. I bought the necessary tools to start chasing and repousse. It’s an ancient technique of metalworking where chasing is essentially embossing and repousse is hammering the reverse side to create a low relief. (Read more here about this technique.) There’s definitely a learning curve but I love a challenge. Above is a pic of the copper in pitch. Pitch holds the piece so you can work on it. 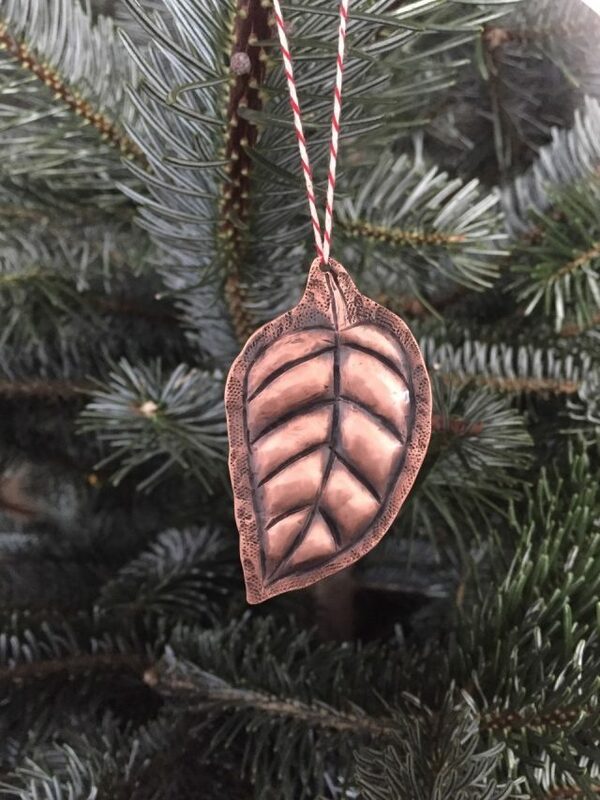 This is the back side of the leaf shape I made. As you can see the form is pushed out. This is the front side of my first piece. Definitely not so perfect but it was fun to work on. 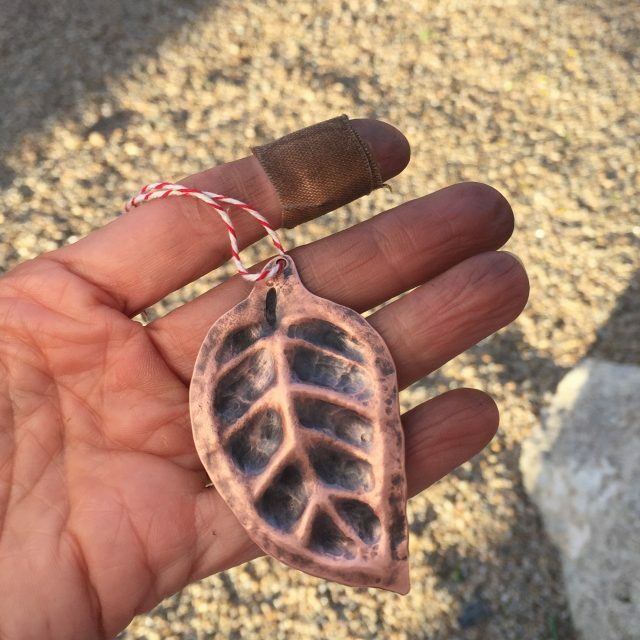 I didn’t think about the gauge of the copper and I jumped right into 18 gauge which was definitely a workout the first time round. It looks like a leaf on steroids…lol!!!! I’ve made a few pieces now. 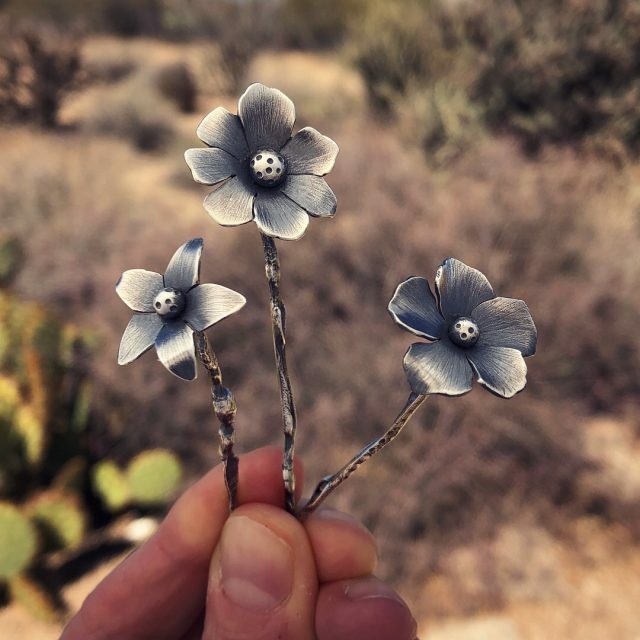 This sterling piece was made using chasing and repousse techniques with sterling silver. I also added a Mexican Campitos turquoise. I chose not to cover up the back with another piece of sterling. I love the raw, organic feel it has this way. 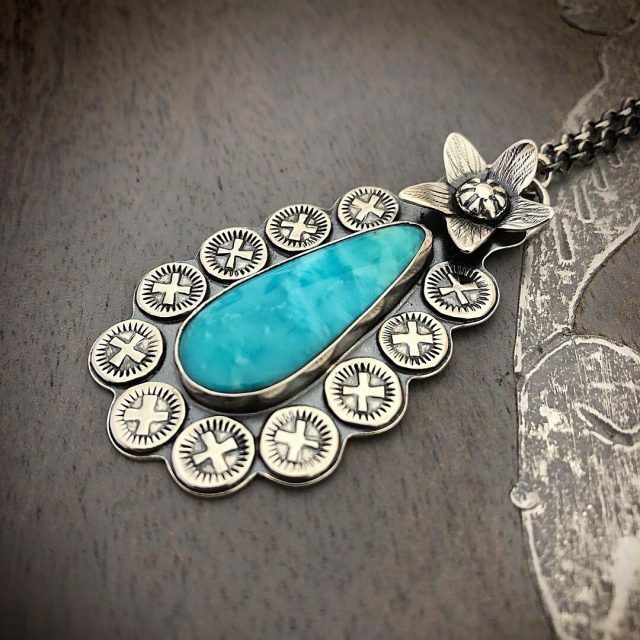 Sterling necklace with Mexican Campitos Turquoise. 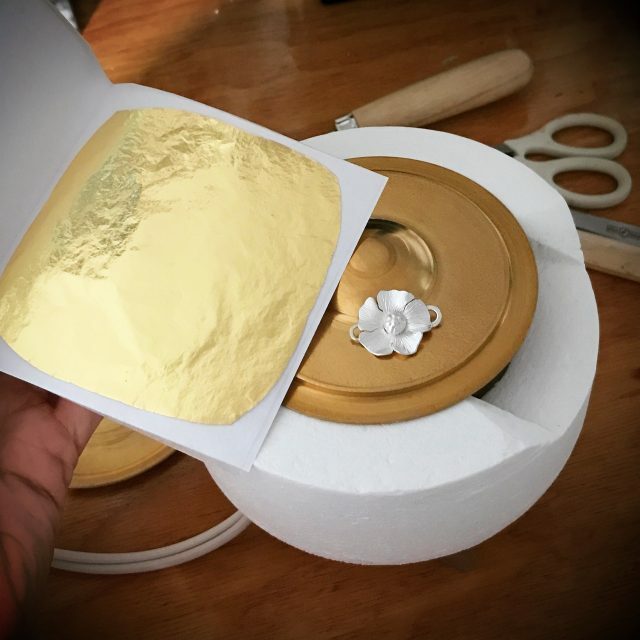 Chasing and repousse will open up a range of new ideas for me this year. 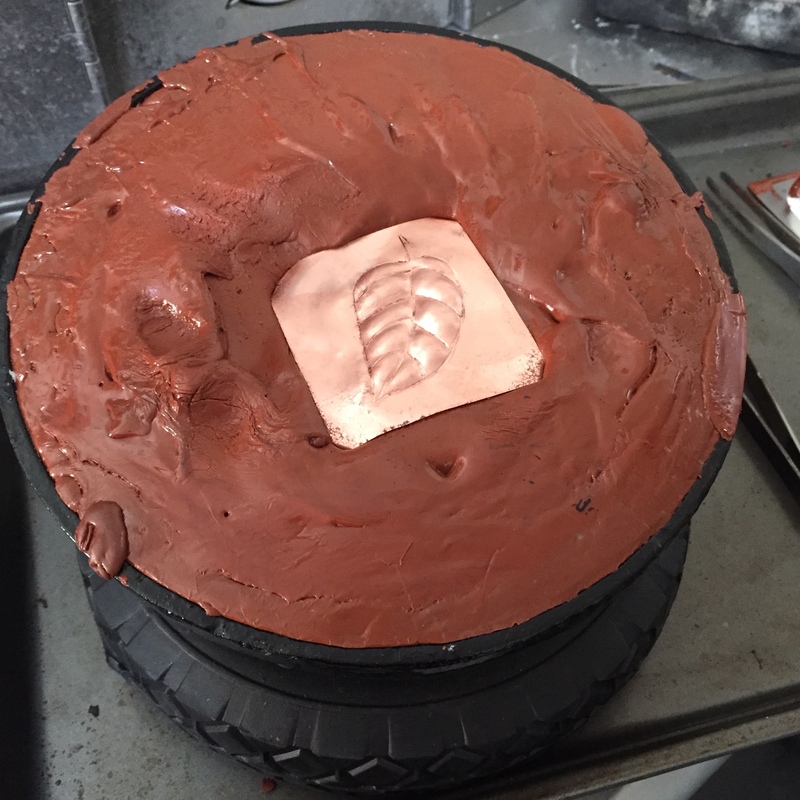 Yes….. it’s time consuming but the payoff is awesome. Stay tuned for new work!! This year I will be participating in Hidden in the Hills 20th annual studio tour and sale in the Cave Creek, Carefree and Scottsdale area. 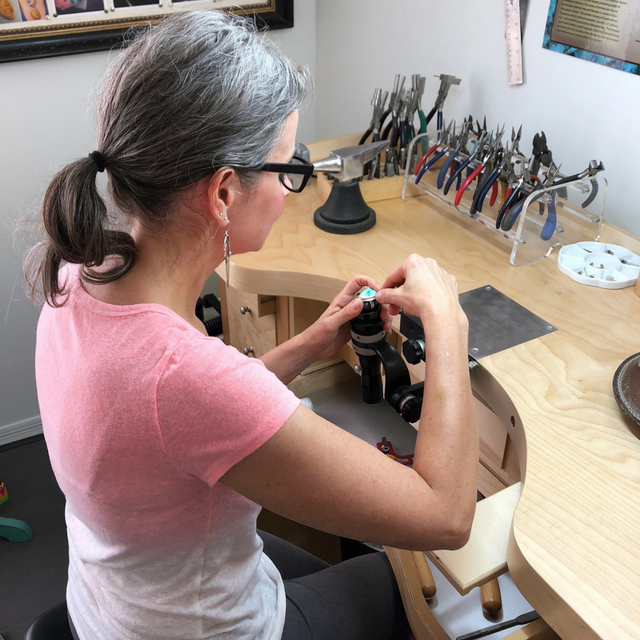 My own studio is not involved due to HOA restrictions but I’m so grateful to be a guest of the amazing glass artist, Carole Perry. I’ve been busy making pieces for the tour. My fingers are raw…lol. 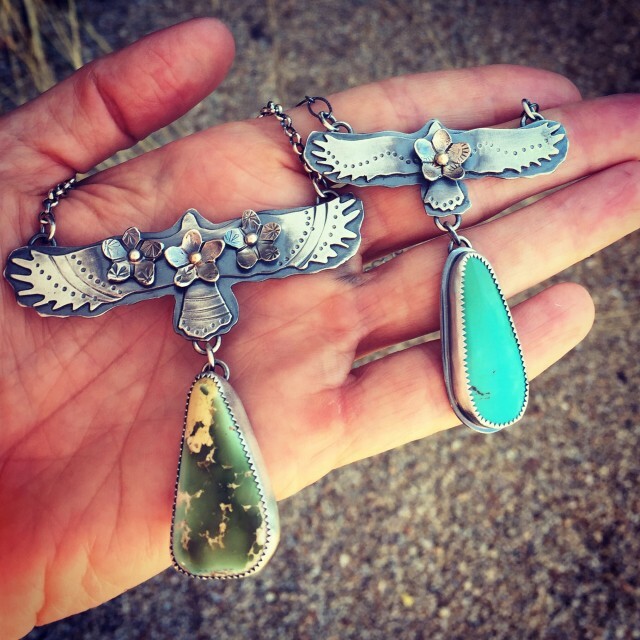 These two sterling eagles with turquoise will be displayed at Hidden in the Hills. They both have a special quote on the back. I’ve made a lot of different pieces for the show. 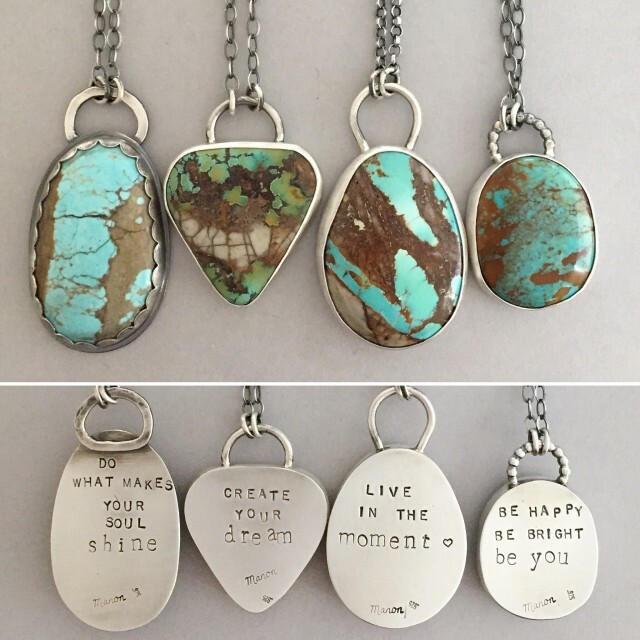 I have lots of beautiful turquoise to work with so it was hard picking which ones to use. This Amazonite gemstone was in my gemstone drawer for a long time. I found inspiration for it this past week. The flower also has a small Amazonite in it. 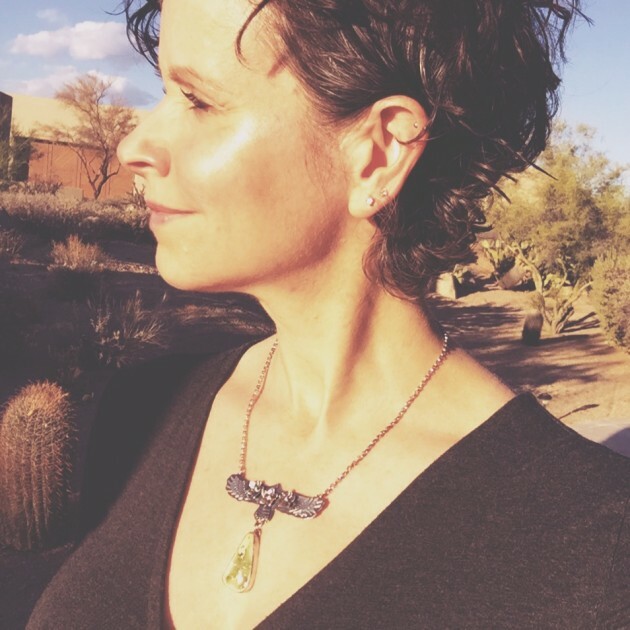 The larger eagle necklace is pictured on me. A clear picture of the stone is above. Hidden in the Hills takes place Nov. 18th – 20th and Nov. 25th – 27th. If you can’t make it the first weekend try and come the second. Sisters of the Sun is in Scottsdale, AZ. All my pieces are 100% handmade by me. 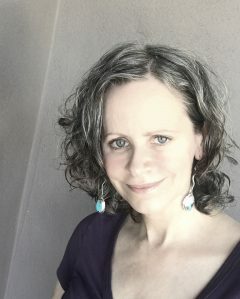 I'm a one woman show so I try to fill orders as fast as I can. 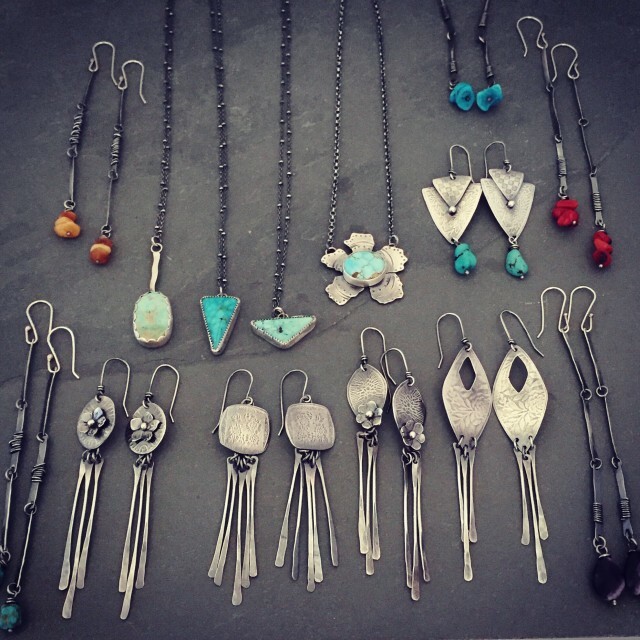 I work with sterling silver and I love to work with turquoise and other gemstones. 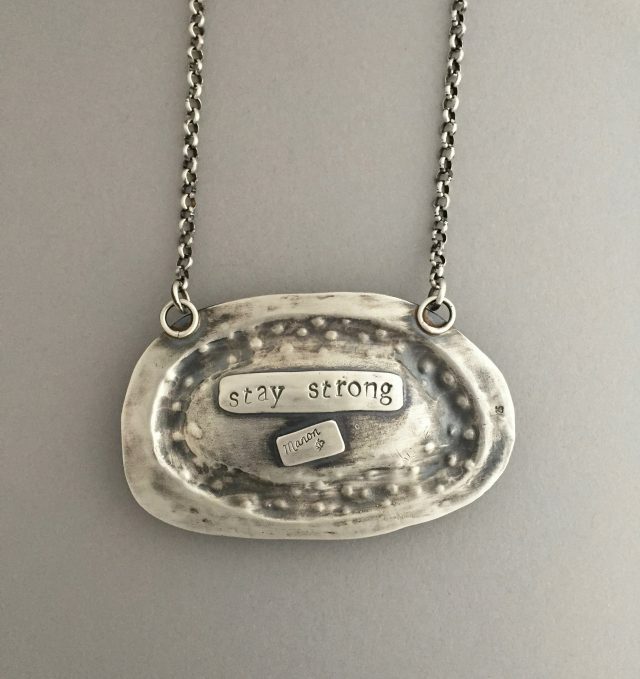 Many of my pieces have an inspiring message. 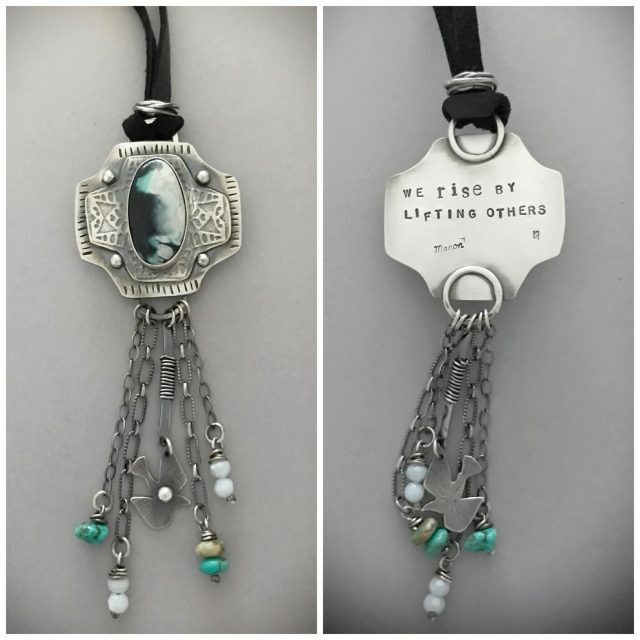 I can work with you on custom orders to personalize your piece. Welcome! 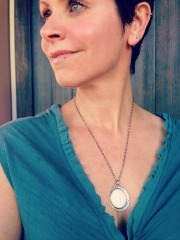 Follow Sisters of the Sun™'s board my jewelry by manon on Pinterest.